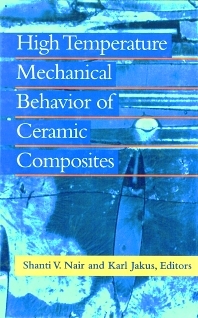 High Temperature Mechanical Behavior of Ceramic Composites provides an up-to-date comprehensive coverage of the mechanical behavior of ceramic matrix composites at elevated temperatures. Topics include both short-term behavior (strength, fracture toughness and R-curve behavior) and long-term behavior (creep, creep-fatigue, delayed failure and lifetime). Emphasis is on a review of fundamentals and on the mechanics and mechanisms underlying properties. This is the first time that complete information of elevated temperature behavior of ceramic composites has ever been compacted together in a single volume. Of particular importance is that each chapter, written by internationally recognized experts, includes a substantial review component enabling the new material to be put in proper perspective. Shanti Nair is Associate Professor at the Department of Mechanical Engineering at the University of Massachusetts at Amherst. Karl Jakus is Professor at the University of Massachusetts at Amherst. Introduction; Interfaces; Residual stresses; Fibre properties; Matrix cracking in unidirectional materials; Matrix cracking in 2-D materials; Stress redistribution; Fatigue, creep, challenges and opportunities.